Aerial view of Torr Works and Asham Wood (click to enlarge view). Located on the south side of the Beacon Hill pericline, this region covers the area between Downhead, Leighton and Chantry, including the delightful Asham Wood. Most of the area is underlain by the Carboniferous Limestone on the southern limb of the Beacon Hill Pericline which dips at around 20º–50º to the south and south-south-east. The Carboniferous Limestone is bounded along its southern margin by the Cranmore Fault which almost follows the A361. The fault is marked by a change in slope between the hard Carboniferous rocks and the softer Jurassic strata. Another fault, the Downhead Fault bounds the Carboniferous Limestone to the west and juxtaposes it against the Portishead Formation. Streams draining the sandstone slopes of Cranmore Hill sink underground into the limestone along the line of the fault. Water-tracing experiments have shown that the water originally flowed to springs in the Leighton valley and Holwell but some of the groundwater flow has been intercepted by the quarrying. In places, particularly to the south-east, younger Jurassic rocks overlie the Carboniferous Limestone. 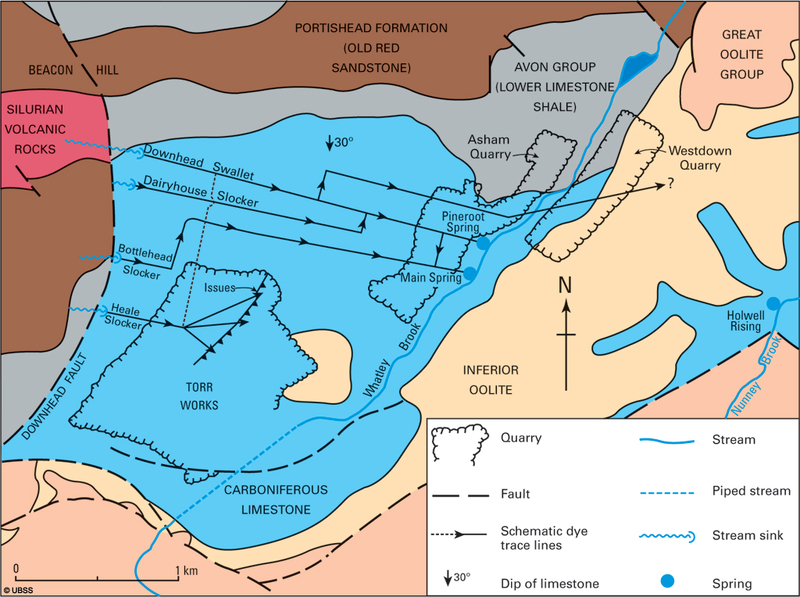 The contact between the limestone and the Inferior Oolite is marked by a well-developed unconformity which is best seen at Tedbury Camp Quarry and Vallis Vale. The hydrogeology of the Torr Works to Asham Wood area, showing the movement of groundwater proved by tracer testing using fluorescent dyes. Adapted from University of Bristol Spelaeological Society Proceedings, Vol. 19(1), 1991 (click to enlarge view). The area is probably best known for the huge Torr Works quarry. 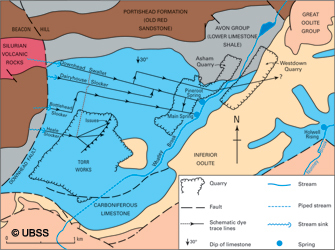 One of the two 'superquarries' located on east Mendip, Torr Works was operated by Foster Yeoman Ltd., but is now owned by Aggregate Industries. The quarry was previously known as Merehead Quarry, but it was purchased by the Yeoman family who redeveloped and renamed the site in the early 1970s. The site is a working quarry, but visits can be arranged by contacting the company in advance. The disused Asham Wood and Westdown Quarries in the Leighton valley clearly expose the lower part of the Black Rock Limestone. The thinly bedded, muddy limestones here are weak and easily folded, and several excellent, highly contorted, fold structures can be seen in Asham Wood Quarry. The stronger, thicker limestone beds farther south are less well folded and dip around 20°–30° to the south. Asham Wood is one of the finest, and largest, examples of ancient semi-natural woodland in the Mendips with a diverse range of woodland communities, reflecting marked differences in the underlying soil. The site is owned and managed as a nature reserve by Hanson Aggregates, who operate Whatley Quarry.